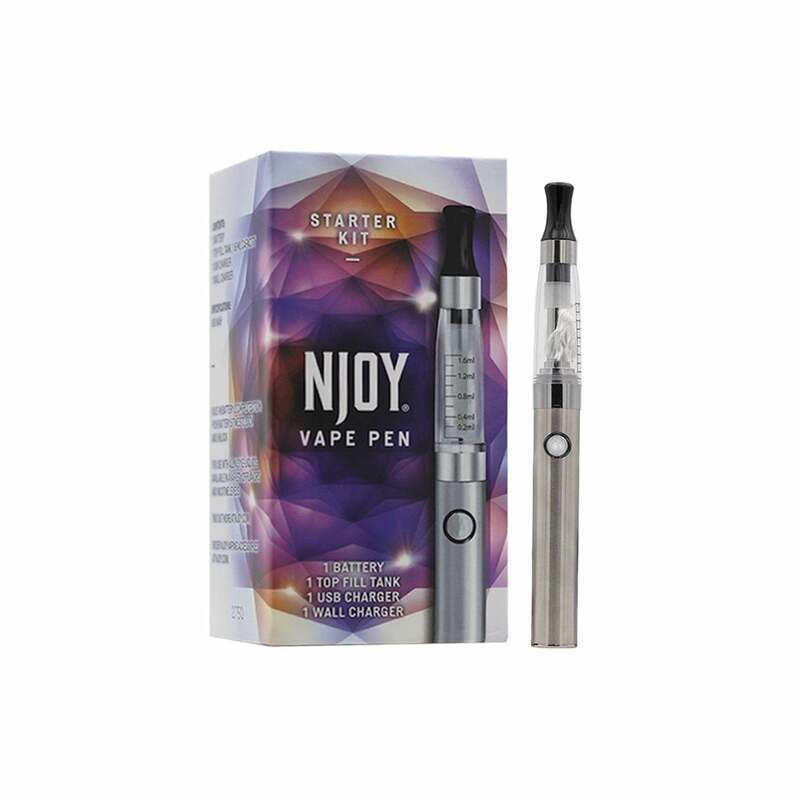 NJOY have a great range of US-made e-liquids to complement this kit. Who is the NJOY Vape Pen for? Anyone looking to make the switch to e-cigarettes, or indeed anyone who has been using the smaller (cigarette-style) ecigs and wants to try a vape pen. At 650mAh the battery will give you a good 6-8 hours' worth of vaping between charges and is also smaller in the hand than those with the bigger (900mAh+) batteries. Never leave batteries unattended whilst charging. Never charge for more than four hours at a time. Yes. The kit contains everything you need to start vaping right away (including a USB charger). Don't forget to add your free e-liquid (on kits that do not come with e-liquid included in the box, a pop-up window will invite you to add a free e-liquid after adding this product to basket). So far everything is good and I like it very well, but I understand they are not available anymore to buy. I heard they are not made anymore. Not my favorite. For some reason this with the recommended tanks burn the e juice. Nice strong hit, battery lasts for a good while and is very easy to operate. Definitely would recommend to anyone starting out, like me. Great starter kit. Comes with everything you need. Pen is sleek and stylish. Comfortable mouth piece. Easy to use. Battery holds a long charge. Stopped working after a month. Very disappointed. It quit working after a couple of weeks. Tried all the troubleshooting but can't get it to work. I'm very happy with this vape pen. The battery seems to last about a day, depending on how much I use it. I like this but have nothing but problems with the vap tanks that I buy. They will not work...I notice the center is higher up then the tanks that comes with the kit wondering if that is the problem. Also the tips ends up breaking off. I'm trying to find something else that will work. I have tried dozens of e-cigs, and now I've finally found the best. There's no comparison this is the one I've recommended to all my friends and family. My wife loves too. Battery dies within 24 hours. Cartridge has to be refilled about 3 times a day. And best of all, I’ve had it for less than 3 weeks and already the mouthpiece no longer meets up correctly with the seal inside. It leaks everywhere all the time. I had to stop using it. Very, very, very disappointed. Again great product, great value and good service. I ordered this vape pen to replace the vuse vibe that got recalled. I think it will work well. It's very similar to the vibe except for that the button has to be depressed for the unit to work, other than that I think this will be a much more economical option in the long term. I chose the 18mg dream 6am liquid which seems to be at least twice as strong (nicotine-wise) as the liquid that comes in a Vibe refill. The airflow of the Njoy is a little more open than thw vibe, which I like, but 4 or 5 puffs of the 18 mg liquid feels stronger than 10 puffs of vibe liquid. I've seen different info as far as the mg rating of vibe liquid, but I thought 24mg seemed logical, so I also ordered some 24mg ice flavored liquid that is really strong, as well as some 50mg liquid, which I haven't even tried yet but based on this experience I'm guessing it will be far too strong. I put some of the 24mg liquid in a stock vibe tank and 3 puffs felt stronger than 10 puffs of vibe liquid. I hope this info helps others who are frustrated with the vibe recall. This is a great replacement and I definitely recommend it for people who aren't familiar with fancy sub ohm devices and other mods. This is a great little setup. If you are looking to replace the recalled Vuse Vibe, this is the most similar device I have found. It would be perfect for a beginner or someone who just wants a smaller device to take when they are out and about. It reminds me of one of the very first vape pens I had around 3 years ago. It’s very easy to fill, and a full tank seems to last about 2.5 days, but I do use a different set up as well. I have bought the prefilled tanks as well as the empty ones, and both seem equally as good and produce nice smooth flavor and a decent amount of vapor. So far I haven’t had any leaks in my tanks. The only minor issue I have noticed so far is that the battery could have a longer life, but that isn’t a huge problem since its not my main set up. The price is good, considering that you get a free bottle of juice from Dream. Definitely worth checking out if you are looking for something really easy and small. The starter kit is well packed with everything you need except juice, which is in a separate box. Charge it up fill the tank and it works perfectly. Very easy to fill and will last all day. No I did order two replacement tanks for different flavors but can't seem to get either one to work with my battery, one worked for a few puffs than quit. So I would guess that the tank that is included with the starter kit is a better quality than it's replacement. I purchased this to replace E-Cigs from the convenient store and I am very happy with this product! Super fast shipping too! 30th April 2018 - Cheryl S.
First impressions were very positive; It's small enough to easily fit in a pocket and produced a good amount of vapor, it was easy to fill and the 5 click safety is a convenient feature. The tank holds a good amount of juice so I don't see it running out over the course of a day unless you are trying to empty it deliberately, For the money you are getting a simple but functional product, it even comes charged so just fill and enjoy. Highly recommended. I haven't vaped before and I was really nervous about getting a bad first experience, I saw a lot of people saying the NJOY was the right first choice so I went with it, it hits well, doesn't burn, and for its size, blows nice clouds. I'm definitely satisfied.